Since you guys so graciously awarded me 1st place in your mouse mod contest - I figured I'd return the favor (or is it punish?) 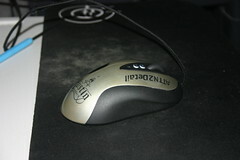 by posting the mouse mod... and continued updates to ATTN2Detail here in your forums. I hope you guys find something for your future mods. 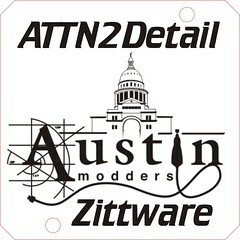 For the last month or so; I've been actively working on ATTN2Detail's Mouse... as an entry for ModdersInc.com's MouseMod contest. 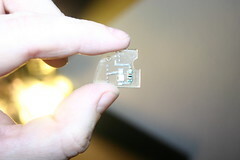 Tonight I give you the results of the work... and for those patient a new method for creating electronic circuits directly into Acrylic sheeting. * Color is nearly correct. 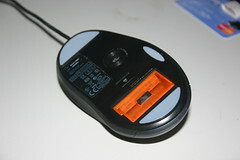 * Black Sleveing of the mouse cord is already built in. 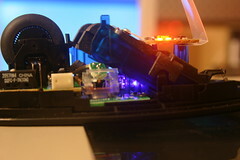 * LED Color is wrong. Orange LEDs do not match ATTN2Detail's Purple Lighting theme. 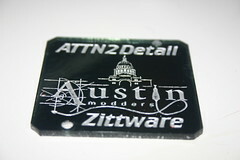 * Orange / Rust &#34;color band&#34; does not match ATTN2Detail's Nickel Plated theme. My goal is to eliminate the Cons with some &#34;flare&#34;. The Orange weight tray had to go... but wasn't sure how to handle this. 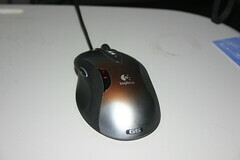 A trip to BestBuy turned up a G5 decentant who was outfited with 4 buttons and a blue weight tray. I had orginally intended to mod only the new kid on the block... but ended up with an issue. The new kid was &#34;cost reduced&#34; by the designer... they had removed all the Weight Tray lighting. 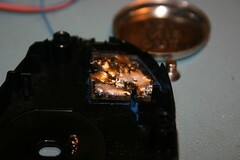 Removed the LEDs... the Transistors and the current limiting resistors. That simply would not do! The kid's uncle decided to donate his unused parts; So begins the task of transplanting the circuitry to the kid. 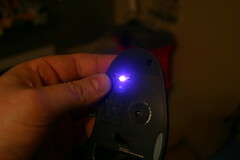 That's it for the LED Mods... since it's Garbage night here in our little neighborhood... I must curb the remainder of the worklog until tomorrow. Now; let's talk about the paint job. 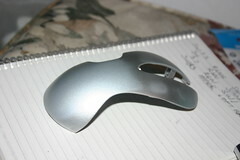 I knew I wanted it to be silver and black to match ATTN2Detail. 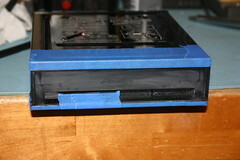 So; I began by spraying the Blue/black Wrinkle with AutoBody sandable primer. I put about three cost of primer down... sanded to even out the wrinkle valleys/hills... until I had a nearly smooth finish. 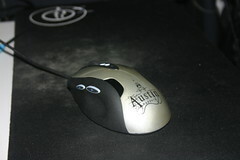 This was the state I brought the mouse for the AMOS LAN last month. 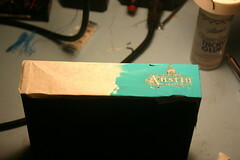 Then I went at the silver with 400grit wet/dry sandpaper to remove the orange peel and remove any mistakes. 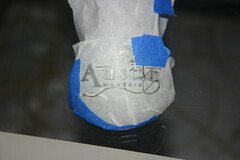 I repeated this process until I got about 12-15 coats of silver metallic down.... Leaving the top orange peel intact. I wanted that many coats for the next process. After leaving the top color coat to dry for 3 days; the fun begins. 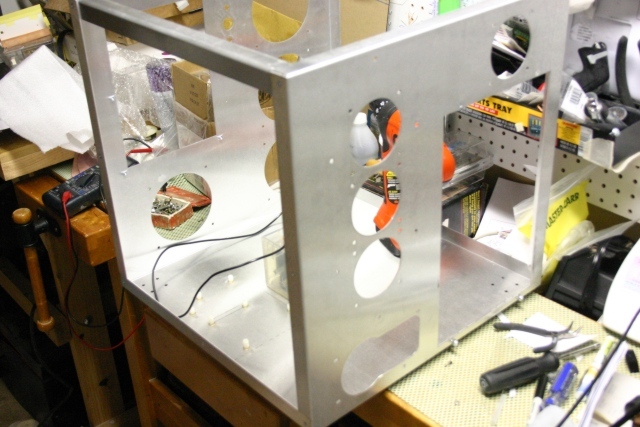 I then proceeded to load the masked mouse body into my Laser Cutter. 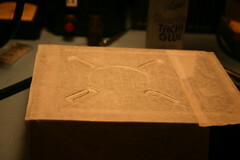 I used the larger beam width 4.0 lens and began to Laser etch each logo on the correct locations. 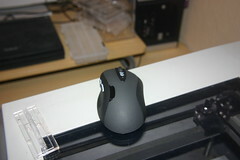 I had to use the 4.0 lens due to the curves of the ergo mouse body would prevent the laser from etching when the beam defocused. 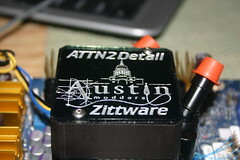 This was tricky because I had to manually adjust the laser to get the logo's in the correct position. I started by approximating the location on the table in the graphics program... then manually moved the mouse on the table until the logo lined up where it needed to be. How did I adjust the correct location? Well I set the laser power to a very low value... I beleive it was 15% power w/ 100% speed and lightly burned the paper top paper. This turned out to be less effecient that putting a light coat of blue airbrush paint on top of the paper... then laser etching. 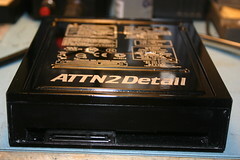 Once I had the logo centered; I turned up the power to 75% and etched the logo several times. 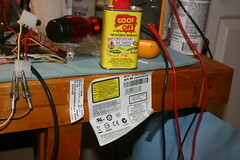 I continued to rerun the laser program until I had burned through all the color coats and saw black paint. Now that I had etched away the paper and the silver color coat; I paint filled the logos with black spray paint without removing the transfer paper. I put approx 3-4 coats of black on the mouse mainly in an attempt to fill the logo areas to nearly the same height as the silver color coat. I let it sit overnight to dry. I removed the transfer paper... did some touch up.... and proceeded to sand the whole mouse body with increasing grit wet/dry paper... starting at 400, 600, 800, 1000, then 1500 grit. 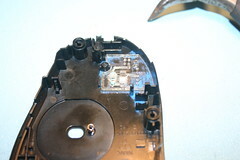 The whole thing had a dull shine which was solved with rubbing compound followed by polishing compound. 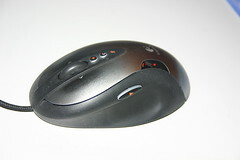 I could now see my reflection in the mouse body. 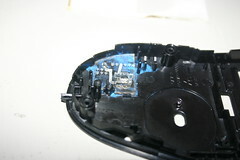 1) Resist paint fading by oily mouse fingers. 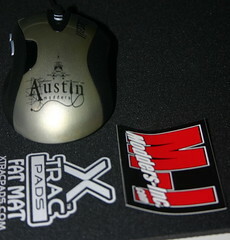 3) to fill in the gaps between the laser etched logos and the rest of the mouse body. After every 3-4 coats; I waited 24hrs and hit it with 400 grit wet/dry paper in the bathroom sink. Again; this was to level the playing fields between the logo and the body. 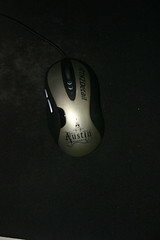 Once I had the the logos at the same height at the rest of the mouse... I repeated the mirror shine process. 400 through polishing compound until I saw my ugly mug in it's surface. The result? The top surface is smooth as glass... no &#34;bumps&#34; or valleys - the logos look like they were born there. Oh, Yeah... I got my hands on a Penryn QX9650 Extreme Edition (quad core, 12MB of L2). 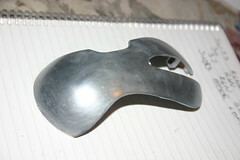 I going parts shopping and hope to have the beasty in ATTN2Detail by the end of the month. 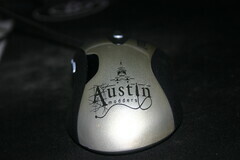 Time to put the finishing touches on the mouse... and provide some insite into my custom, top secret project. 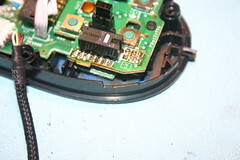 I didn't really need to use this technique inside the mouse; but I wanted to prove it was possible to do... and give the mouse ultimate diassembly capabilities. 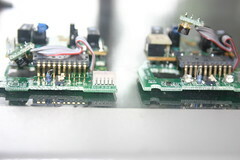 Originally; I came up with this technique to allow custom electronic circuits to be embedded into plexi. 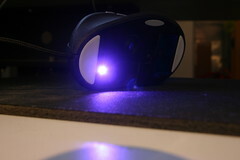 For the mouse; I wanted to mod it so it had an purple surface mounted LED shinning under the mouse to give it some ground effects. I wanted to identify where the new circuit would go; in this case it's the box on the right hand side of the screen. I then layed out the components using the cad drawing as a reference. The red lines are vector cuts... and the grey lines are etches. Wait; but Mr.Zitt... I don't see the point... all you got there is a peice of plastic; it's not like the damn LED lights up. Several months ago... I came across this awesome metal alloy that you can make with a glass sauce pan... and some metals off Ebay... 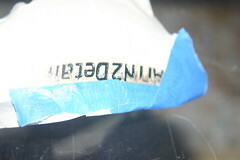 This alloy is called a fusible alloy in which the alloy will melt at managable temperatures. 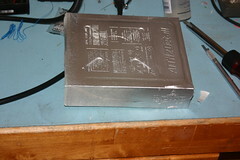 By managable; I mean temperatures below that of the melting point of the acrylic - usually below: 266Ã‚Â°F. 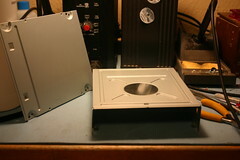 We want to keep the temperature way below 266F to pervent the acrylic from deforming or bending. I decided to implement Newton's Metal using the recipe at SciToys.com - IE using equal parts by Weight. I used a postal scale to measure out the equal parts. I got the 60/40% Lead Solder as a bar... and the bismuth as needles off of ebay. I heated the metals in a glass sauce pan that I got from a garage sale. Why Glass? 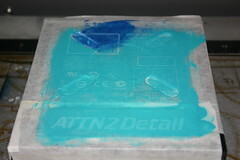 1) I use it for my Dye mixtures. 2) For the sake of your marrage; DON'T use the wife's saucepans. 3) Lead is toxic; you wouldn't want to cook your food in the same pan after you've melted the lead. 4) I don't want the metals interacting a metal saucepan or the Teflon coatings or whatever coating is used on cheap dollar store pans. Now; once you have Newton's metal; you can use boiling water to melt it. :idea: IE it melts at 97C or ~212F. And it won't melt the plastic. 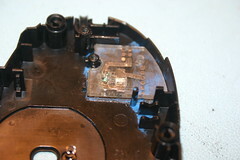 Now; we melt the metal and pour it into the laser etch circuit patterns. Obviously, I haven't perfected the melt/pour process yet... What I really want is to be able to squeegie the metal into the groves. Not sure how to do that just yet. The only option I had at this point was to put the new assembly on my belt sander along with some file work; so I could get a flat circuit. Remember; you saw it first here. 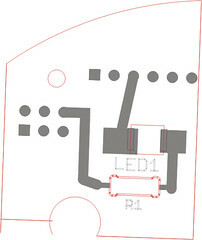 My original intent was to use it on Acylic windows to embed circuits such as LED lighting for laser cut etches... or maybe as a keypad using one of those Qprox touch sensors. Why did I go through all of this? 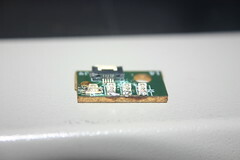 Well; mainly when I bolt the top circuit board down; it makes electical contact with the pads of the metal circuit; delivering power to the LED. 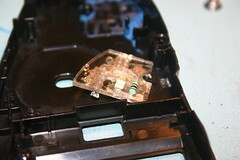 If you look closely just under the black omron switch you'll see the clear acrylic pcb under the circuit board. Hard to see; but really no other way to show the bugger. 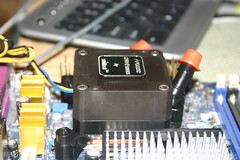 Stay tuned; shortly I hope to be posting the mod of my new APOGEET Drive Self Powered CPU water-block which was part of my QX9750 + Intel 48BT2 (bonetrail) upgrade of ATTN2Detail. Remember to vote/prop ATTN2Detail at ModShop.net. 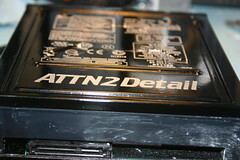 Now we turn our attention to the cpu block... I decided that I wasn't getting enough flow through my water block on the CPU and since I was upgrading the proc and motherboard to a Penyrn EE QX9650 and an Intel &#34;BoneTrail&#34; DX48BT2 it was time to check these off the list. Why the BT2? 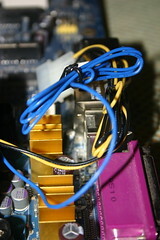 Well; in short it was the only somewhat inexpensive board available at my local Frys which supported the QX9650. The good thing is that it's another Black extreme board; so it'd look just peachy in ATTN2Detail. 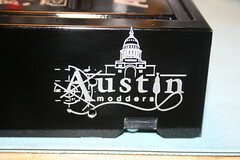 That darn logo would have to go... as would the unsleeved wiring. 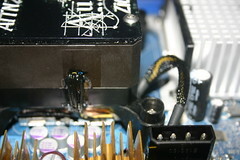 Now the attention turns to the yellow/black/blue wires comming out of the pump. 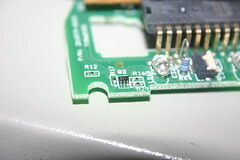 The final installation takes the pump wire harness between the motherboard backside and the motherboard pan... so it's hidden from view. 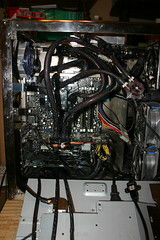 I have some other plans to execute before QuakeCon'08... hope I get to them; cause ATTN2Detail needs some TLC. 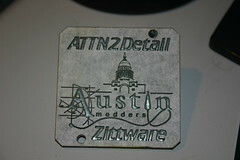 As appears to be tradition here ... ATTN2Detail is getting some upgrades in prepration for Quakecon'08. Since upgrading to the Intel DX48BT2... 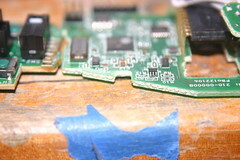 I've lost the functionality of my damn IDE ATA100 CD Devices. For some reason - There's a bug in the bios that prevents the single IDE port on the motherboard to screw with the CD Devices if you enable ICH9R raid on the motherboard. 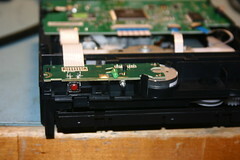 This means my previous Yamaha CDRW F1 CD burner and the Plextor DVD burner no longer function. 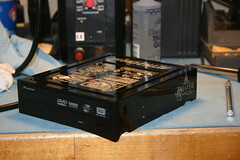 So I went to NewEgg.com and purchased a new Pioneer SATA DVD+R 20x burner so that I could access media at Quakecon'08. 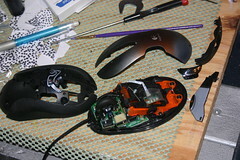 Ofcourse; as is typical in this mod - we must first Void any warranty present on the new equipment. 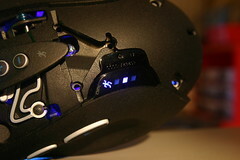 Remember to Click the Pics for Higher Rez shots. 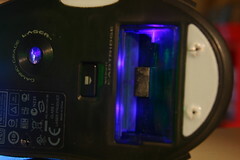 Replaced with a UV Purple LED. 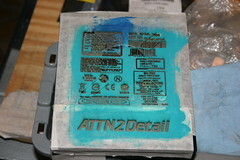 The PowderCoating process is the same as used earlier in the mod... please go there if you want in process pics. Now that I had black magic powder coated drives; I had to find an excuse to use the laser cutter . I like the black look and everything but I think the Drive would have looked best without all those specs on it. Just black with ATTN2Detail at the bottom. just my 2 cents though. Looks awesome either way though. Awesome! I like the specs, they definitely draw a double-take. If I didn't know that it was etched, I would start looking for the edge of the black sticker.